And we thought we knew Earth’s mountains. Nope. 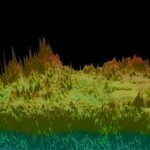 Scientists at the International Polar Year conference in Norway this week revealed startling new images of the Gamburtsev Mountain Range of Antarctica, a huge and mysterious “ghost range” buried beneath more than a mile of ice. The images are the result of radar technology, and reveal a dramatic landscape of rocky summits, deep river valleys, and liquid, not frozen, lakes, all hidden beneath the ice. The range itself rivals the Alps in size and cover an area that is roughly the size of New York State. Flying twin-engine light aircraft the equivalent of several trips around the globe and establishing a network of seismic instruments across an area the size of Texas, a U.S.-led, international team of scientists in 2009 not only verified the existence of the mountain range, which is thought is to have caused the massive East Antarctic Ice Sheet to form, but also has created a detailed picture of the rugged landscape. 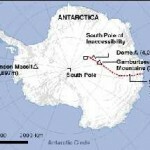 “Our seven-nation team has produced detailed images of last unexplored mountain range on Earth,” said Michael Studinger, of also of Columbia University’s Lamont-Doherty Earth Observatory and the co-leader of the U.S. portion of the Antarctica’s Gamburtsev Province (AGAP) project. 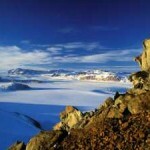 The Gamburtsev Mountain Range (also known as the Gamburtsev Subglacial Mountains) is a subglacial mountain range located in Eastern Antarctica. The range was discovered by the Third Soviet Antarctic Expedition in 1958 and is named for Soviet geophysicist Grigoriy A. Gamburtsev. It is unknown how the mountains were formed, though the current speculated age of the range is over 34 million years and possibly 500 million years. Current models suggest that the East Antarctic ice sheet was formed from the glaciers that began sliding down the Gamburtsev range at the end of the Eocene. 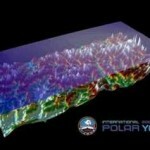 The introduction of the new images stole the spotlight at the International Polar Year Conference in Oslo, Norway. At what was said the biggest polar scientists meeting ever held, the participating scientists were expected to present their latest findings about the climate change in polar regions. The changes in the polar region, the polar ecosystem, the human dimension of change and linkage between polar regions and global ecological systems, were the main topics at the conference. Large, liquid lakes in mountain valleys buried beneath several kilometers of ice, possibly existing for as long as Earth’s entire post-Cambrian epoch of 500-million years… what occurs to everyone is, let’s find out if life in any form exists in this environment. If it does, may we not say that for all practical purposes it may as well be extraterrestrial– Earth-bound in origin, but so far divorced from geophysical evolution as to constitute alien life-forms. If Saturn’s Encheladus, with her fifty-mile deep oceans, may harbor life, why not indeed Antarctica’s “Ghost Mountains” in their remote recesses? Of-course the Gamburtsev range found in Atlantic Ocean by Best Scientist in the world.The disaster of earth will be due to leakage of Ozone layer in our orbit below the earth surface. The the Gamburtsev range comes up or go down on massive earth quake and moving of Ghost Mountain will be happened due to the sliding of Tectonic plate and other related surface, after melting of Glacier at the rate of 100% sure. The sign of alien is nowhere in such the Gamburtsev range and we cannot see UFO even at the time of Disaster.